Strong risk appetite carries through from US to Asian markets after Democrat’s regain of majority in House after the mid-term election. Nikkei closed up strongly by 401.12 pts or 1.82% at 22486.92. Hong Kong HSI is up 0.76% at the time of writing. Singapore Strait Times is up 0.90%. But China Shanghai SSE is up only 0.07%. Probably, Chinese investor know that there won’t be any material change in China policy of the US. Overnight, DOWN closed up 545.29 pts or 2.13% at 26180.30. S&P 500 gained 2.12% while NASDAQ rose 2.64%. Treasury yields were steady with 10 year yield closed down -0.001% at 3.213. In the currency markets, strong risk appetite continue to support Australian and New Zealand Dollar. Canadian Dollar doesn’t join the ride as WTI oil continues it’s free fall to below 62. Yen is naturally the weakest one with current market sentiments. Dollar is currently the second weakest for today. But it should be noted that the greenback has already pared back much of this week’s loss against Euro and Swiss Franc. And the post election selloff in Dollar hasn’t accelerated so far. Technically, Euro’s weakness is actually worth a mention. Both EUR/GBP and EUR/AUD are starting to gather downside momentum again. EUR/JPY is struggling to take out 130.20 key near term resistance for now. 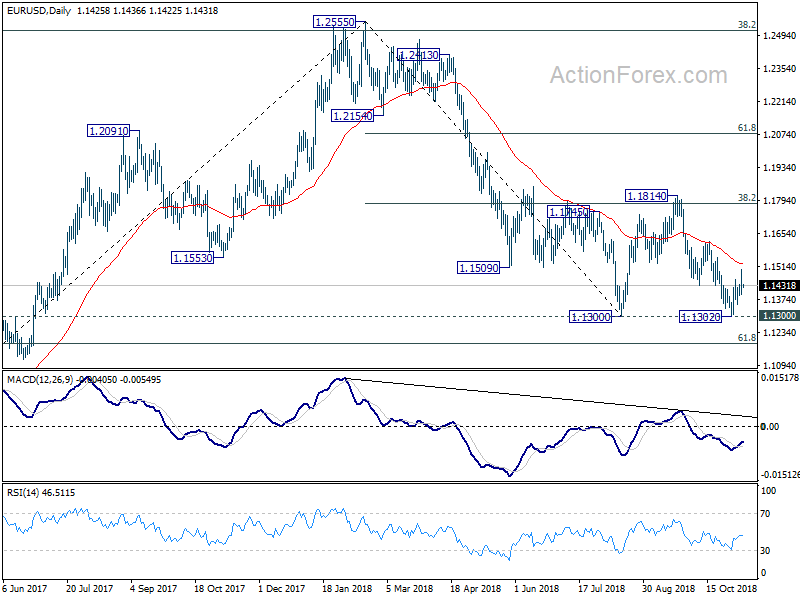 Even EUR/CHF is losing momentum ahead of 1.1501 resistance. 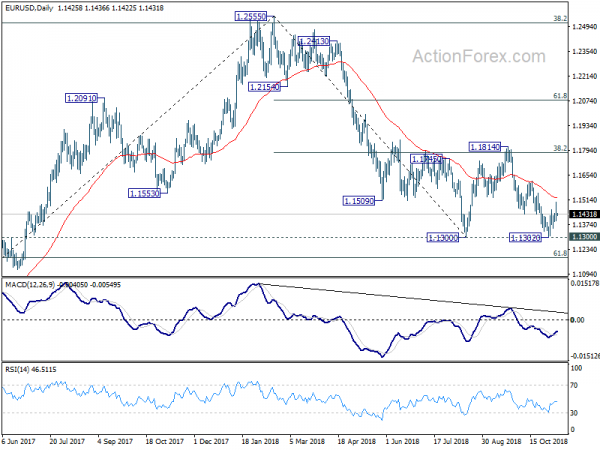 A break of 1.1353 minor support in EUR/USD will switch the fortune between these two currencies. With the mid-term election now behind, focus will turn to FOMC rate decision and statement. Fed is widely expected to keep federal funds rate unchanged at 2.00-2.25%. Also, the accompanying statement would also reiterate the strength in the job market as well as strong rate of growth. Also, inflation is near Fed’s target of 2%. The focus for the near term is another rate hike in December. Currently, fed funds futures are pricing in around 80% chance of that. For 2019, we’d probably only get more hints on Fed policy makers’ view in next economic projections. But so far, it seems there is consensus among FOMC members that Fed would at least continue the rate hike till hitting neutral rate level. New Zealand Dollar stays firm after RBNZ left OCR unchanged at 1.75% as widely expected. In the accompanying statement, RBNZ maintained the intention to keep OCR unchanged “through 2019 and into 2020”. The language that the “the direction of our next OCR move could be up or down” was removed. Instead, RBNZ said “there are both upside and downside risks to our growth and inflation projections. As always, the timing and direction of any future OCR move remains data dependent.”. That at first glance looked like the central bank is moving away from the possibility of a cut. However, Governor Adrian Orr made it clear in the press conference that “it would be pointless to remove that option”, regarding a cut. Orr also talked down the pick-up in GDP growth in the June quarter as “partly due to temporary factors”. Instead, he pointed to businesses surveys which “suggest growth will be soft in the near term”. While employment is “around its “maximum sustainable level”, core inflation remains below 2% target mid-point, “necessitating continued supportive monetary policy”. BoJ released the summary of opinions at October 30/31 monetary policy meeting today. There the central reiterated that the economy is “likely to continue expanding”. It noted “positive momentum in domestic demand”. The September Tankan survey also “reconfirmed enterprises’ strong fixed investment stance”. On inflation, BoJ maintained that CPI is “likely to continue accelerating moderately” but the developments have been “weak and unstable”. And, “rise in inflation has been delayed with a positive output gap” as inflation mechanism is becoming “complex”. On monetary policy, BoJ noted “t is important to consider in a flexible manner such factors as the range of yield movement and the target maturity of JGBs in conducting yield curve control, while maintaining the framework of monetary easing.” This suggested policymakers are considering further tweak to the current framework. Also from Japan, Machine orders dropped -18.3% mom in September versus expectation of -8.9% mom. Current account surplus narrowed to JPY 1.33T. From China, exports rose 15.6% yoy in October to USD 217.3B. Imports rose 21.4% yoy to USD 183.2B. Trade surplus widened to USD 34.0B, below expectation of USD 36.3B. In CNY terms, exports rose 20.1% to CNY 1490B. Imports rose 26.3% to 1257B. Trade surplus widened to CNY 234B, above expectation of CNY 209B. Swiss will release unemployment rate in European session. German trade balance will also be featured. ECB will release monthly bulletin too. Later in the day, Canada will relase housing starts and new housing price index. US will release jobless claims as usual on a Thursday. But main focus will be on FOMC rate decision and statement. Daily Pivots: (S1) 1.1380; (P) 1.1441; (R1) 1.1486; More…. 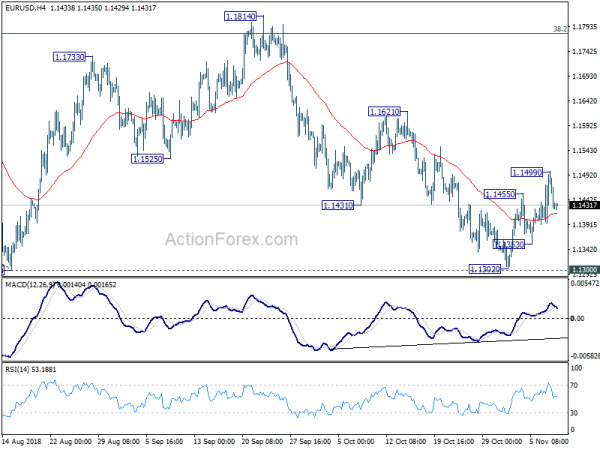 EUR/USD retreated sharply after hitting 1.1499. Intraday bias is turned neutral first. On the upside, break of 1.1499 will target 1.1621 resistance and possibly above. But price actions from 1.1300 are viewed as forming a consolidation pattern. Therefore, upside upside is expected to be limited by 1.1814 to bring down trend resumption eventually. On the downside, break of 1.1353 minor support will suggest that rise from 1.1302 has completed. In that case, retest of 1.1300 key support should be seen next. In the bigger picture, price actions from 1.1300 is seen as a corrective pattern. Decisive break of 1.1300 will resume the down trend from 1.2555 to 61.8% retracement of 1.0339 (2017 low) to 1.2555 at 1.1186 next. Sustained break there will pave the way to retest 1.0339. In case the consolidation from 1.1300 extends, upside should be limited by 1.1814 and 38.2% retracement of 1.2555 to 1.1300 at 1.1779. to bring down trend resumption eventually.